Organ donation is the gift of an organ to help someone who needs a transplant to improve or save their life. The generosity of donors and their families helps people in Worcestershire every year. Expert staff from NHS blood and transplant work at our hospitals. 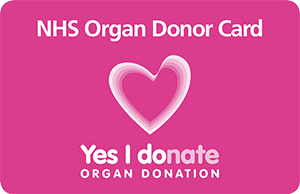 They support families and ensure that you can make your own informed choice about organ donation. Worcestershire patients having a transplant are transferred to the Birmingham Queen Elizabeth Hospital. Birmingham’s transplantation programme is the biggest in Europe. Find out more at: www.uhb.nhs.uk. Did you know that you can donate healthy corneas and other tissue up to 80 years of age? If you register to donate corneas, you could give up to four people the gift of sight. Corneal transplants are carried out by surgeons at our trust. Corneal transplants can give the gift of sight by replacing damaged eye tissue, but corneal donation can be a real taboo. In 2011, just 20 transplant procedures were carried out in Worcestershire. When you think that anyone up to the age of 80 is able to donate corneas, that’s not many. We wanted to improve things for people in Worcestershire waiting for corneal transplants. So we made sure it’s as easy as possible for families and individuals to donate corneas, if they are happy to do so. We now carry out about 40 corneal transplants every year. You can record your organ and tissue donation wishes on the NHS Organ Donor Register. You can join the register at any age. If you signed up manually (on a card) years ago, you will need to renew your pledge by signing up online or over the phone. The Organ Donation Committee aims to raise awareness of the importance of organ donation and to increase the number of organs being donated across the county by providing better support to potential donors and their families. The committee is made up of clinical staff from across our hospitals, non-clinical staff, volunteers and donor family representatives.